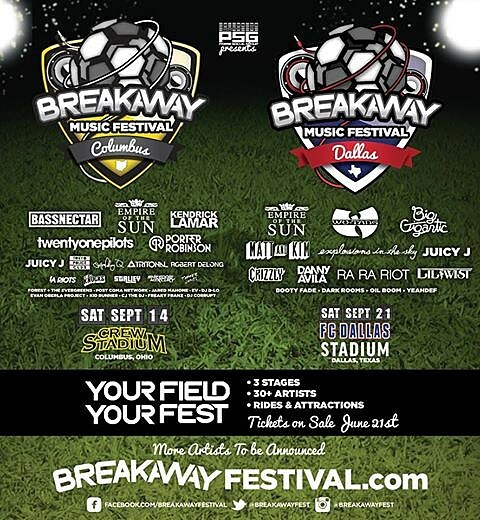 Breakaway Music Festival is set to launch on September 14 and September 21. The brand new Major League Soccer stadium-based festival, which is being put on by Columbus-based Prime Social Group, is only being held in two cities this year: Columbus, OH and Frisco, TX. The Frisco one happens at FC Dallas Stadium, and the lineup includes Wu-Tang Clan, Explosions in the Sky, Juicy J, Ra Ra Riot, Empire Of The Sun, Matt & Kim, and many more across three stages. Tickets for the Frisco date of Breakaway Music Festival go on sale today (6/21) at 10 AM.